For over 55 years, official public and parish notices and other matters requiring to be brought to the attention of the public have been published within The Jersey Gazette. Official notices include enactments made by the States of Jersey and the dates of forthcoming parish assemblies and elections. Notices inform businesses of the deadlines for making their manpower returns, they notify car and boat owners of the impending removal of their vehicle or vessel, and advertise when trading units become available in the markets. Planning applications and appeals, transport and parking matters, events and many more categories of information can be found. Notices also extend to our utility companies and organisations such as the Jersey Financial Services Commission. The Official Publications (Jersey) Law 1960 designates that the, “Jersey Gazette shall be published in an English language newspaper circulating in Jersey,” and the Jersey Gazette Act 1960 designates the Jersey Evening Post as the newspaper in which the Jersey Gazette shall be published. The Jersey Gazette Act came into force on 1 December 1960. Each year, thousands of column centimetres are published in The Jersey Gazette, and this trusted information is used on a daily basis by a wide range of people and organisations. Our challenge is to transform The Jersey Gazette from a printed publication to an online service. What would be achieved by putting the Gazette online? This project has two objectives: to improve the information service to the public and to deliver cost savings. 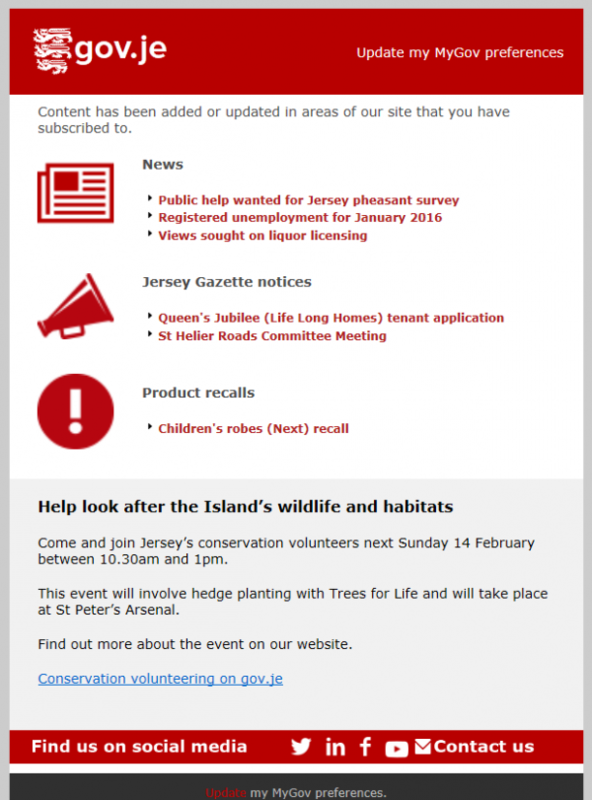 Rather than publish Gazette notices exclusively in the Jersey Evening Post there is now a requirement for notices to be more freely available, to make them easier to search and retrieve beyond the date they were published, and to allow users the option to subscribe to an email alert when a notice that might be relevant to them is added. Parishes and departments must pay to publish notices in The Jersey Gazette. In 2014, the cost of placing classifieds, recruitment advertisements and notices in the Jersey Evening Post was £272,260. Between 2010 – 2014 the average annual cost was approximately £245,000. Centralised solutions offer value for money and allow for oversight, monitoring and measurement, so gov.je was chosen as the home for publishing official notices online. A single page template has been created to standardise the appearance of notices, making the information easy to read. An existing gov.je landing page layout and search filters were used to ensure consistency for users when using the site. Using gov.je’s responsive page layouts also ensures that notices can be displayed by the majority of devices and browsers. To enable users to subscribe to receive notices by email we extended the existing email notification functionality, provided by our MyGov platform, allowing both new and existing subscribers to manage their email preferences in one place. Users can opt-in to receive all notices or specify a particular type of notice, a department or a single parish. Delivering a few page layouts on an existing website hasn’t really been a large part of the challenge. Now that the ‘Official notices’ area of gov.je is live – we’ll be using that title until such a time that the law is changed – our task is to demonstrate that this new information channel has value; to both publishers and the public. We also need to provide training to a large number of new users, many of whom will not have needed to edit content on gov.je before. The Jersey Gazette will remain unchanged for a time and readers can continue to find official notices towards the back of the Jersey Evening Post. A period of parallel publishing will take place during 2016 to enable new users to be trained to edit gov.je and for existing design and publishing contracts to be honoured. Once the online version becomes established and adopted widely the Council of Ministers will propose that the Jersey Gazette Act be amended. At that point savings against the £245,000 annual costs can be realised. An RSS feed is available to publishers wishing to include official notices within their own web projects. We’ve employed the RSS Feed to provide a dedicated Twitter account. To encourage greater discoverability structured data markup, using the schema.org protocol, has been employed to assist search engines in understanding and presenting content. To enable personalisation you can subscribe to receive official notices via email alongside our regular news and job updates.